Figure 21-1. 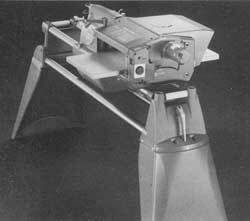 The Thickness Planer can be mounted on the MARK V, as shown, or on the Shopsmith Power Stand. 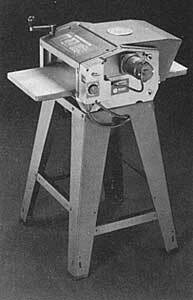 Shopsmith has two models of planers: the Thickness Planer and the Professional Planer. The Thickness Planer mounts on the Mark V(Figure 21-1)or a Shopsmith Power Stand. The Professional Planer has its own stand and motor (Figure 21-2). In terms of what it does, the planer might be the simplest power tool in a home woodworking shop. Yet, simple as it is, when teamed with other power tools, the planer gives you everything you need to transform all kinds of lumber into useful, beautiful and fun projects. It gives you greater freedom to work with hardwood, softwood, even trees from your backyard or logs from your wood pile. Adding a planer is a great step toward achieving a totally self-sufficient home woodworking shop. Figure 21-2. The Professional Planer has its own stand with its own motor. Don't confuse the planer with the jointer. The planer is not the best tool to use for straightening cupped or warped stock. These defects should be removed with the jointer before you plane the stock. One: It planes the surface of a workpiece so that it's smooth and flat. Sometimes this means it will remove a large amount of stock in several passes (such as when you're planing a really rough piece of lumber). At other times it can be set to take off just a small amount (when you want to get an extremely smooth, final surface). Two: The planer wilt plane any number of boards to the exact same thickness. To set up your planer, follow the instructions in the Owners Manual that came with your planer. The planer will plane stock from 4" down to 3/32" thick. It can handle boards from 1" up to 12" wide. The length of stock is limited only to what you can safely control. The cutterhead revolves on two sealed ball bearings and holds three precision-ground steel knives. Each knife is 12-1/4" long and rests on three knife leveling screws so that you don't have to match grind the knives. With the knives installed, the cutterhead is 2-1/4" in diameter. The table surface is 28" long and 12-1/2" Wide. The table is held parallel to the cutterhead by four threaded posts. The vertical position can be adjusted from 3/32" to 4" away from the cutting edge of the knives. The 1/20 horsepower variable-speed feed motor feeds stock through the planer. The actual feed rate at any given feed control setting will vary depending on the depth of cut, sharpness of the knives and width of the stock. The cutterhead holds three knives. Each knife is held in the cutter-head by two metal wedges with four locking screws through each wedge. In all, eight locking screws hold each knife in place. In addition, the knives themselves are wedge-shaped. Each knife is slightly thicker at the bottom than it is at the top. When properly seated, the wedges and the knives interlock. Warning: Use only Shopsmith Planer Knives in your planer. Other brands of knives are not wedge-shaped and will not seat properly in the cutterhead. Using off-brands of knives is extremely dangerous. Check the wedge locking screws immediately if an unusual noise, vibration, or uneven cuts develop and after every 10 hours of use. There are also three knife leveling screws under each end and under the middle of each knife. These screws allow you to adjust all three knives to precisely the same height without the need for costly and time consuming match grinding. Danger Zone--The planer danger zone is separated physically by the infeed and outfeed shields. It is extremely dangerous to place your hands inside or under the shields. This rule applies not only when the planer is running, but whenever the planer is plugged in. The danger zone also extends 6' directly in front and to the rear of the stock being planed because the planer can kick stock and chips in both directions. Always stand to the right side (the switch side gives you maximum control) of the planer and keep your hands from under the infeed and outfeed shields whenever the planer is plugged in. There is one exception to this rule: You must put your hands in front of or behind the openings to feed and receive stock. But don't put your hands into the openings or stand so that your body is in line with these openings. Keep the infeed and outfeed shields in place and locked down. Never operate the planer without the protective shields in place and properly secured. Don't let your fingers be pinched between the stock and the table. Release the stock as soon as the infeed roller grabs It. Never reach under the infeed or outfeed shield to adjust a workpiece or brush away wood chips while the planer is running. Turn off and unplug the machine, let the cutterhead come to a complete stop, then reach in with a push stick or similar wooden or plastic tool. Never reach under the infeed or outfeed shield with a metal tool. You could nick the knives. 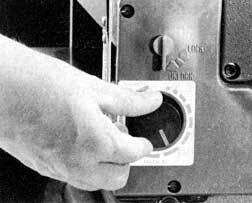 If you need to reach under the infeed or outfeed shield with your hands, turn off and unplug the machine and let the cutterhead come to a complete stop before doing so. When planing glued-up stock, make sure glue joints are strong. Glue the stock and leave it clamped for at least 24 hours before planing. Plane dry, properly cured wood only. Wet sawdust and shavings will adhere to the knives, causing the machine to cut poorly. The moisture will also rust the knives and other ferrous metal parts of the planer. Never plane 'secondhand' lumber. Hitting a nail or screw will ruin the planer knives and possibly cause injury. Don't plane wood that has large, loose knots and other imperfections which might cause the board to split or fly loose. Never plane painted or varnished wood, plywood, or particle board-these materials will ruin your planer knives. Always plane with the grain direction of the wood. Don't plane stock less than 1" wide or over 12" wide. If the stock is too narrow, the antikickback fingers will not catch it. If it's too wide, it may jam between the sides of the planer. Don't plane stock less than 12" long. If the stock is too short, it will not feed properly and you will have to reach Into the danger zone in order to plane it. Don't plane stock that's higher than it is wide as it sits on the table. (This is sometimes called edge planing.) Edge planing is dangerous because the board can easily tip over and be kicked back. The stock should remain parallel to the sides of the planer table as it's fed through the machine. If a board begins to drift to one side, very carefully shift it back into position by pushing against one side or the other with a push stick. Don't push or pull a board through the planer. Let the machine do the work. If the stock stops feeding, immediately turn off and unplug the planer and wait until it stops. Lower the table and remove the stock. See what caused the jam; then correct the problem. Never force a jammed board. If a strange noise or vibration develops, immediately turn off and unplug the planer. Do not operate the machine again until you have found and corrected the problem. When removing large amounts of stock, the best and safest way is to make several passes. The maximum depth of cut on the thickness planer is 3/32" for most operations. The maximum depth of cut for the professional planer Is 1/8". Most operations require that you take a shallower depth of cut. Don't plane boards of different thicknesses in the same pass. Because the planer must be adjusted for the thicker board, the rollers would not hold the thinner board securely and it might be kicked back. Feed just one board into the planer at a time. Never plane two or more boards side by side-one board may interfere with the others. When working with long or heavy boards, support the work with one or two roller stands placed 1' to 4' out from the machine. Never leave the thickness planer running unattended. When you're finished planing, turn off and unplug the planer. Don't lean on the planer, whether it's running or not. And never stand on the planer or use it as a step stool. You could harm yourself and your planer. Never use your planer as a storage shelf. Small tools, screws, and nails could roll under the shields. When the planer is turned on, these objects could be thrown out, severely damaging the machine-or injuring you. Make sure the machine rests firmly on the floor-not up on its retractable casters. Use only Shopsmlth Planer Knives; other brands of knives are not wedge-shaped and will not seat properly in the cutterhead. Do not attempt to disassem-ble or repair the control box. Figure 21-3. Always make thickness adjustments from a greater to a lesser thickness, turning the thickness adjustment crank clockwise and raising the table. Turn the thickness adjustment crank counterclockwise to lower the table and accommodate thicker stock. Turn the crank clockwise to raise the table and decrease the final thickness of the planed lumber (Figure 21-3). Always make this adjustment from a greater to a lesser thickness. For instance, if you want to plane a board 3/4" thick, first lower the table so that it goes down past the 3/4" mark on the thickness scale at least one full turn of the crank. Then raise the table up to the mark. This maneuver takes up any slack in the thickness adjusting mechanism. If you don't set the thickness from greater to lesser, there's a chance the planer table may "drift" down slightly during the pass and you'll get a tapered board. By adjusting the thickness, you also adjust the depth of cut-how much stock the planer removes from a board in a single pass. To remove 1/16" of stock from a 3/4" board, turn the thickness adjustment mechanism clockwise one full revolution. Warning: Never turn the thickness adjustment mechanism while you are planing stock. Figure 21-4. To increase the power feed rate, turn the feed control clockwise. To decrease the feed, turn the feed control counterclockwise. the sharpness of the knives. The harder the wood, the wider the board, the deeper the cut, the duller the knives, the slower you want to set the cutterhead speed and feed rate. As you plane softer woods, narrower boards, or take shallower cuts with sharp knives, you can use faster speeds and feed rates. To determine the correct speed and feed rate for an operation, first look up the hardness of the wood you're planing in Table 21-1. Measure the width of the widest board and decide the amount of stock you want to remove in each pass. Then look up the recommended feed rates in Table 21-2. To a lesser extent, speed and feed rates also depend on the grain pattern of the stock. As the grain becomes more figured or "wild," or the more knots there are in the grain, the slower the speed and feed rates should be. If the planer "bogs down" during a cut, even though the cutterhead speed and the feed rate are set properly, immediately lower the feed rate to let the planer catch up. On the next pass, try a slower feed rate. If that doesn't work, try a shallower depth of cut, then a slower cutterhead speed-in that order. 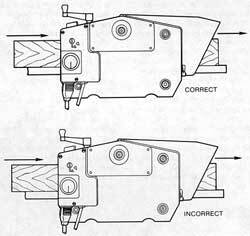 Do not continue to run the planer at a speed or feed rate that causes the machine to labor or stop during a cut. Caution: If you operate the planer at too high of a speed, the motor that powers the cutterhead will overheat, blow fuses, and may burn out. You'll also find your planed stock gets smoother as you take shallower cuts. A shallow depth of cut does not lift the wood grain as badly, and it reduces the risk of chipping or tearing out hunks of wood. To get the smoothest possible surface on your planed stock, reduce the depth of cut to 1/64" or less on the last pass through the planer. Increase the cutterhead speed one to two letters and decrease the feed rate to SLOW. If the planer slows or stops during a pass when the feed rate has already been adjusted to SLOW, turn off the machine immediately. Lower the table and remove the stock. Try the pass again with a shallower depth of cut. If that doesn't help, try a slower cutterhead speed (Mark V mounted thickness planer only). Measure the thickness of the board you're about to plane at its thickest point. 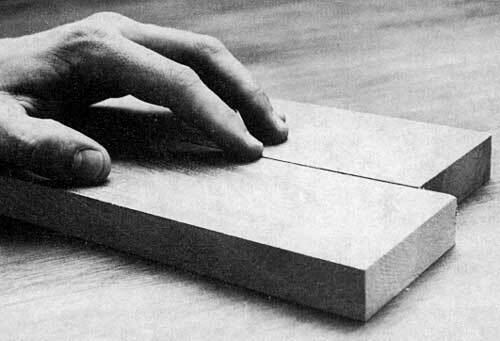 Then adjust the table so that the depth of cut pointer is exactly indicating the thickness of the thickest part of the board. Always make your first pass at "0" depth of cut. This will even out any inconsistencies in the thickness of the stock. two roller stands out 1' to 4' from the infeed and/or outfeed tables. Make sure these stands are adjusted to precisely the same height as the table; then remember to readjust them each time you raise or lower the table. Turn on the planer and set the cutterhead speed and feed rate; then turn the machine off again. Figure 21-5. To feed a board into the planer, hold the board parallel to the sides of the table; then push it forward until the infeed roller grabs it. Continue to support the board as needed, but do not push or pull the board once the rollers are feeding it through the planer. Take a comfortable stance to either side of the infeed opening, as near to the planer power switch as possible. Turn the planer on and let it come up to speed. Hold the board parallel to the sides of the table; then feed it forward until the infeed roller grabs it (Figure 21-5). Continue to support the board as it feeds into the planer, but do not push or pull it through the machine. Let the rollers do the work. Watch that the stock doesn't drift toward one side of the table, but always remains centered under the cutterhead. Watch that the stock continues to feed at a steady rate. Listen that the planer doesn't begin to slow or stop in the middle of a cut. Watch and listen that the stock doesn't chip, splinter, or tear out. If the stock begins to drift toward one side of the table or the other, gently press against the infeed or outfeed end of the stock to straighten it as the stock is being cut. Warning: Never put your hands under the in feed or outfeed shield! If you can't straighten the stock or if the stock jams in the planer, turn of f and unplug the machine and let It come to a complete stop. Lower the table and remove the stock. Remove any wood chips or sawdust that might be blocking the path. Then repeat the pass. The depth of cut may be set too deep. The planer may be cutting against the wood grain. The stock may have wild, figured grain or dense, hard knots. The knives may be worn and dull. If the problem is that the cutterhead slows, reduce the depth of cut or decrease the cutterhead speed. If the wood is chipping, reduce the depth of cut or increase the cutterhead speed. Also try turning the board end-for-end if the wood seems to be tearing along the grain. If the cause of the problem is figured wood grain or knots, you may have to take very light cuts at a very slow feed rate. If the wood seems to hesitate or stick as you feed it, but neither the cutterhead nor the feed motor slows down, the rollers need to be cleaned or the table needs to be waxed--or both. Clean the rollers with a damp cloth and apply paste wax to the table. Dry off the rollers and buff the table carefully. Locate the cause of the problem and correct it; then repeat the pass, watching and listening carefully to see that the problem does not reappear. If an unusual vibration develops or if you hear excessive chipping and splintering, immediately turn off the planer. Do not operate the machine until you have located and corrected the problem. Figure 21-6. Support the stock as it comes off the outfeed table. Don't pull the stock any faster than the rollers want to feed it. As the stock emerges from the planer, move to the outfeed side of the machine, keeping your body to the right of the outfeed opening. Support the stock as it is fed out, but don't pull it any faster than the rollers want to feed it (Figure 21-6). Once the outfeed roller lets go of the stock, remove it from the planer. Inspect the board for any chipped or torn spots. If there are no problems, readjust the depth of cut and feed the board into the planer for another pass. Make repeat passes until you have reduced the board to the desired thickness. Figure 21-7. When you're planing stock to a desired thickness, you need a tool to measure the thickness. 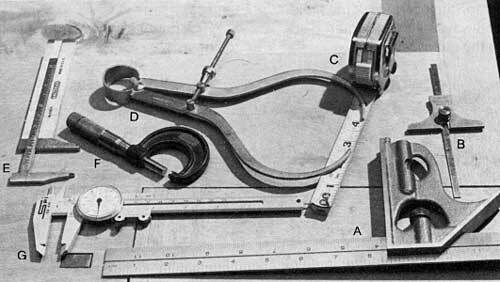 Shown here are a combination square (A), depth gauge (B), tape measure (C), outside calipers (D), vernier calipers (E), micrometer (F), and dial calipers (G). All of them will work well when measuring thickness, but dial calipers are perhaps the handiest. Accuracy--When you're planing stock to a desired thickness, you'll probably want to measure the thickness many times as the stock approaches the final dimension. Several measuring tools will work well--a combination square, depth gauge, tape measure, outside calipers, vernier calipers, micrometer, or dial calipers (Figure 21-7). If you want a tool that is easy to use and accurate, choose the dial calipers. Figure 21-8. Check your stock before you feed it inot the planer. The knives should cut with the grain direction. Click on image for larger view. Wood Grain Direction--Always feed the stock so that the knives are cutting in the same direction as the wood grain (Figure 21-8). If you cut against the grain, the wood may chip out or even be torn apart in the planer (Figure 21-9). The grain direction is usually easy to determine by the look and feel of the workpiece. Looks can be deceiving, though, especially with close-grained woods. If the stock starts to knock or kick back against the infeed roller or you hear wood chipping out, quickly turn the feed rate down to SLOW. If this doesn't help, immediately turn off the planer. When the machine comes to a complete stop, lower the table and remove the stock from the planer. Turn the board end-for-end and try the pass again. Figure 21-9. If you feed the wood against the grain, you may get a rough, chipped out surface as shown on the right. Feed the wood with the grain to insure a smooth surface as shown on the left. Knots and Trouble Spots-- Wood with knots, wild grain, or extensive figuring is always difficult to surface and requires extra care. Check that any knots in a board are solid. Warning: Never plane stock with loose or cracked knots. Feed the work very slowly and take light cuts (1/128" to 1/64"). Be especially cautious of kickbacks and stop cutting immediately if the stock will not feed smoothly. Figure 21-10. It's normal for the planer to cut a small snipe (less than 0.005" deep) in the end of a board as shown on the right. But if you let a board droop when it's fed into or coming out of the planer, the knives may cut a pronounced snipe in one end as shown on the left. Keep the board parallel to the flat on the table at all times. 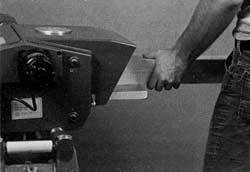 Sniping--If you let the stock droop when it's being fed into or coming out of the planer, the knives may cut a large snipe at the beginning or the end of the board (Figure 21-10). A small snipe (less than 0.005" deep) is normal. But if the snipes are deep, be more careful as to how you support the stock. Keep it parallel to and flat on the table at all times. Less often sniping may be caused by weak roller pressure. 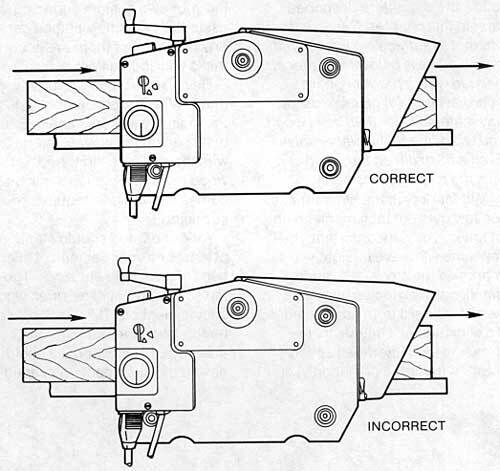 If the planer continues to cut a pronounced snipe no matter how you feed the stock, check the roller springs, following the procedure in the Planer Owners Manual. Figure 21-11. Damaged or nicked knives will leave long ridges on the planed stock. Inspect each board before you plane it to insure ther are no staples, tacks, paint, dirt, glue beads, or similar materials that will damage the knives. Never plane plywood, hardboard, or any material other than solid wood. 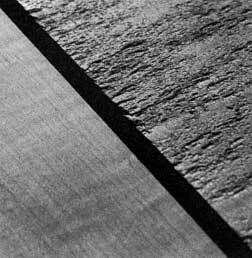 Ridges--Damaged or nicked knives leave long ridges on the surface of the planed stock, running the entire length of the board (Figure 21-11). These ridges detract from the finished surface of the wood and may interfere with the accuracy of your woodworking. The only way to restore the knives so they won't leave these long ridges is to have them reground. To avoid damaging the planer knives, inspect each board before you plane it. Be sure there are no nails, staples, tacks, dirt, paint, or similar materials on or in the wood. If you must surface glued-up stock, follow the procedure described later in this chapter. Caution: If you attempt to surface old lumber with rusted off nails below the surface, painted wood, plywood, hard-board, wood with glue beads, or any material other than solid wood, you will damage the planer knives. Even a bit of dirt on the wood can nick the planer knives badly. Mill Marks--If the planer makes too few cuts per inch or the height of the knives is inconsistent, the machine will leave unsightly mill marks on the stock. Mill marks are small, parallel ripples that run across a board from edge-to-edge. 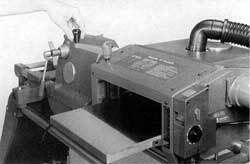 To eliminate mill marks, try increasing the cutterhead speed (Mark V mounted planer only) or decreasing the feed rate. If the mill marks persist, check the knife positions. Buying rough-cut lumber and doing your own custom surfacing is essentially no different than general planing, but there are a few tricks you should know. Be sure the wood is properly dried. Wet or green lumber clogs the machine as you plane it. Sap builds up on the knives, interfering with the cutting action. And as the wood dries, the planed stock becomes uneven and requires resurfacing. Air-dried wood should stand for at least one year per inch of thickness of the rough-cut stock. 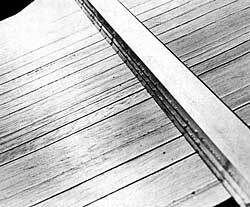 The moisture content of air-dried wood should be about 12% to 19%. You needn't worry about how long kiln-dried wood stands, but it should have a moisture content of about 10%. If the wood is to be used for fine furniture or cabinets, some woodworkers prefer a moisture content of about 7% to 8%. Joint one edge before surfacing a board. 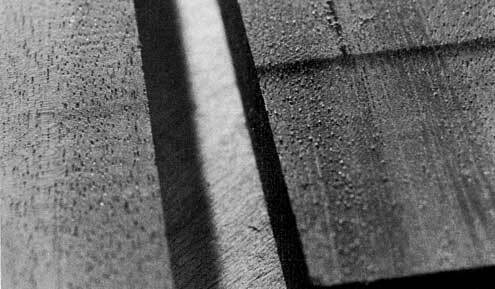 It's almost impossible to determine the grain direction in a rough-cut board. By jointing one edge before you plane a board, you can determine which way the grain is running and feed the board into the planer so that the knives cut with the grain. Measure to find the thickest part of the board. As wood dries, its dimensions become inconsistent--including its thickness. Measure the thickness of a rough-cut board at several places and set the depth of cut for the first pass according to the thickest spot. Take very shallow cuts at first. Just as it's difficult to tell the grain direction in a rough-cut board, it's also difficult to tell how the grain is figured. To avoid ruining the wood, take shallow cuts (1/64" to 1/32") until you can tell whether there are any burls, bird's eyes, or other unusual grain patterns. Remember to surface both sides. Plane one side until you have removed all the saw marks; then turn the board over and plane it to the desired thickness. Figure 21-12. To tell if one board has been planed down to approximately the same thickness as another, place the two boards side-by-side on a flat surface. 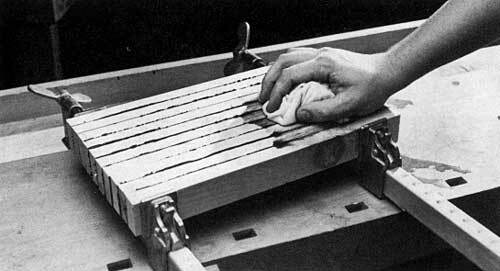 Then simply feel the step between the edges of the boards with your hand. When thicknessing, you often need to plane two or more boards to identical thicknesses. To do this, start by planing the thickest board. Plane it down to the thickness of the next thickest boards; then begin to plane both boards at the same depth-of-cut settings. Cut these two boards down to the thickness of the third thickest board; then plane all three. Continue in this manner until you are planing all of the boards. Never feed two or more boards side-by-side through the planer. The boards may interfere with each other as they pass through the machine, causing them to jam or kick back. A simple way to tell if one board has been planed down to approximately the same thickness as another is to place both boards on a flat surface, side-by-side. With your hand, feel the step from the edge of one board to the next (Figure 21-12). If the step seems higher than 1/64", continue planing the thicker board. If it's smaller than 1/64"--or there is no step-- you can begin planing both boards at the same depth-of-cut settings. Finish up by planing all of the boards at the same depth-of-cut setting at least once. This will insure that all boards are cut to identical thicknesses. Figure 21-13. 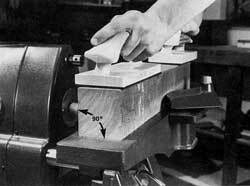 To square stock, start by squaring one corner on a jointer. Joint two adjacent sides so that they are exactly 90° apart. The planer can also be used to square turning stock, furniture legs, and posts. Start by rough-cutting your stock square, leaving at least 1/8" extra stock for planing. Square one corner of the stock on a jointer, jointing two adjacent sides so that they are exactly 90° apart (Figure 21-13). On the end grain of the stock, mark the sides opposite the joined sides S1 and S2. Set the depth of cut on the planer; then plane the stock with side S1 up. Without changing the depth of cut, make a second pass with side S2 (Figure 21-14). Continue in this manner until you have planed the stock to the desired dimensions. If you wish to square two or more boards, you can combine this procedure with the procedure for "Planing Boards to Identical Thicknesses," described earlier in this article. Figure 21-14. On the end grain, mark the sides opposite the jointed sides S1 and S2. Plane the board with side S1 up; then without changing the depth of cut, repeat the pass with side S2 up. Figure 21-15. If you wish to plane glued-up stock, scrub the wood with a wet rag while the glue is still wet. Be sure to remove all the glue on the surface of the stock. If any surface glue remains after the glue dries, remove it with a scraper or a belt sander. Warning: Allow the glued-up stock to dry at least 24 hours before planing it. After you glue up the stock, scrub all the glue off the surface with a wet rag (Figure 21-15). This will prevent glue beads from forming on the surface of the wood. Allow the glue to dry at least 24 hours; then check the stock for any surface glue you might have missed. If you find any, remove it with a scraper or a belt sander. Warning: Glued-up stock must dry for 24 hours prior to planing. If it doesn't, the stock may come apart in the planer. When you plane glued-up stock, take a shallow depth of cut (1/32" or less) and use a slower feed rate than normal.When you're finished, check the planer knives for built-up pitch and signs of wear.